ANNAPOLIS, Md. — Ask any Navy Midshipman, there’s one team you absolutely must beat every year. “It’s Army. 100 percent,” said Navy co-captain Greyson Torain. “Army. No doubt,” added fellow co-captain Ryan Wade. The two teams meet up this Saturday. “As soon as you step foot inside of the Naval Academy you are taught ‘Go Navy. Beat Army,’ said Wade. “From the first day the Plebes get here it’s just instilled in them Army is our rival and biggest game of the year,” said Navy Head Coach Rick Sowell. This year’s game has a little more at stake. The two men's lacrosse programs will be celebrating their 100th meeting. The Mids have tallied 67 wins all-time to be exact, including the last four in the regular season. They’d like that streak to continue. With three games to go the Mids are in fifth place in the Patriot League standings with a 3-3 conference record. They need a top six finish to qualify for the conference tournament. “It’s a big game because it’s Army, but it’s also a big game because it’s a league game,” said Sowell. “It might be the difference between a first-round game and traveling for the first game in the Patriot League playoffs,” added Wade. And the Mids will take the field in special white throwback uniforms featuring Billy the goat. “Oh, the uniforms are awesome,” said Torain. Before the men go at it, the women of Army and Navy will face off. 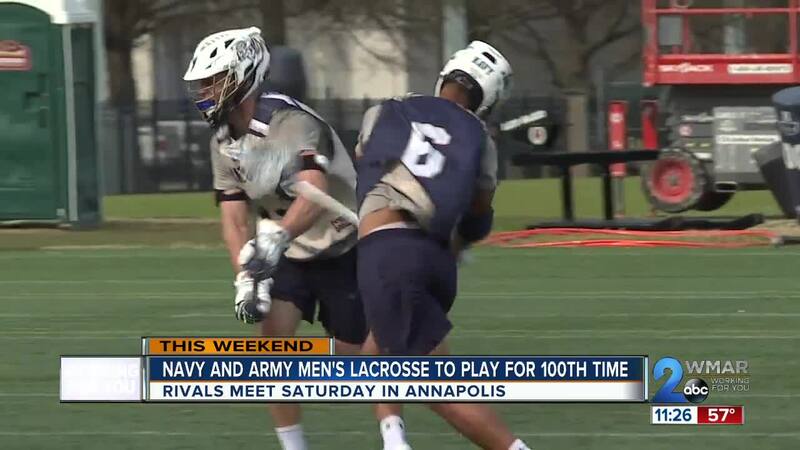 That game starts at 1:00 p.m. Saturday will mark the first time that Army and Navy will play each other, in both men’s and women’s lacrosse, on the same day at Navy-Marine Corps Memorial Stadium. The men’s game is scheduled to start at 3:30 p.m.